Vaguely recall reading years ago that the four peaks were representative of the four resort areas. Apologies if this is a stupid question , why there aren't any lift to Mt Kosciusko ? Just curious . If it were allowed the quickest way would require an extenison of lifts from thredbo to the top of the ramsheads then two lifts to service kossie. (1 up, and 1to get back up the ramshead) potentially a hotham like set up could work. Both these lifts would be very windy propositions. so not a lot of bang for buck. Ramshead is no more - just a few stauncheon poles left and one cable. or is that mountain or area called Ramshead? 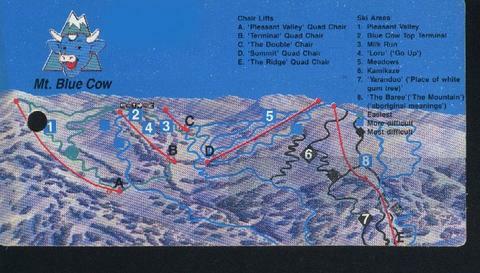 The Ramshead Range are the hills in left front of you as you ride the Basin T bar. Or even the whole stretch above the Thredbo River from the Ramshead in the W to past Rainbow Lake in the E. Sometimes called the Crackenback Range as well. Does anyone know the history of the ski tow that use to be on Round Mt.? Doing some work on my caravan today and I finally got around to photographing some of the old trail maps I promised to do several years ago. The Guthega map is from about 1985 and the Blue Cow one is the oldest I have. Snow Blowey, Zimboo, nfip and 1 other person like this. Also a trail map from the season immediately after Blue Cow amalgamated with Guthega (before one of the Calf lifts became Brumby T-bar). Snow Blowey, robbo mcs, Zimboo and 2 others like this. Interestingly 7. Proposed Quad is shown on the Guthega map. And the Duplex would be blardy handy to this day. Some of us joked that they should have called the new quad chair the "Proposed Quad" in honour of just how long it was proposed for! Also the Calf area was overall better with both T-bars there, other than the race kids got priority and the run down the top half of where the removed T line is is pretty good (plus the bottom of Dorfer being wider as a result of the removal is a good thing for safety too). Season before last we went down there for a week or so (for the snowmagedon system). One big snow morning we tubed it straight to Blue Cow and headed directly over to Guthega for first lifts.........(lots of others had the same idea). Skied in to find Freedom chair was on hold which funnelled everyone coming from Blue Cow down to the Calf T..................big big bottleneck full of very itchy powder seeking people! Both T's would have been great that morning!!!!! After we got out of there, it turned out to be a blessing in disguise as the next couple of hours we did multiple laps of double chair/T-bar/Parachute. Will never forget that day. I had in mind there was a period of time when the Blue Cow runs were not named, at least on the maps. Also, I have a vague notion that 'Roller Coaster' was not a run when Mt Blue Cow opened in 1987, so somewhere I must have a map without it, because I never throw trail maps out, but the question is where? Didn't it open in 1985? I remember having a hardcover book from then. Around 150 pages. With each of these trail maps on there. 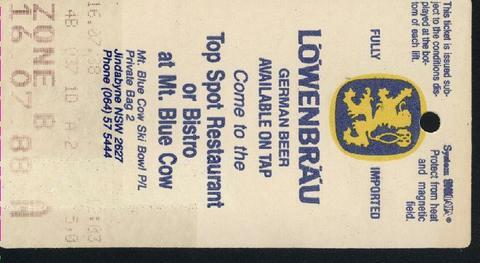 Mt Blue Cow opened in 1987 as did the SkiTube from Bullocks Flat to Perisher. Buses provided a shuttle through the tunnel to take skiers to Mt Blue Cow. The SkiTube fully opened to Mt Blue Cow in 1988. Yup I remember my first time to BC. There were turnstiles and KM tickets. Yes those tickets were so high tech then, except that after a run down the hill you'd see people trying to work out where it was when it was actually wrapped around the back of their neck, then you'd put it in the reader and let go and the elastic would fly back and hit you in the face! I don't think those buses would have run very much further after a season thundering up and down that tunnel. When Blue Cow opened their km tickets were great for those of us with Guthega season passes and staying in a lodge over there for an extended period - meant you could go to the supermarket in Perisher for groceries or to the (original, small, downstairs) Brunelli's for a good coffee without digging a car out or needing to buy a Perisher ticket or even a full-day Blue Cow one, the km ones lasted quite a while when used for just those cross-resort jaunts. Yeah was 25kms and 50kms if memory serves me right. PV quad used to eat it fast. That's right. Pleasant Valley and The Ridge counted as 2kms and the others as 1km as I recall. I remember one day taking a group over to see Blue Cow and they bought half day AM tickets, so after lunch I used my km ticket to put us all back on to Pleasant Valley and we skied home downhill via Perisher. A favourite trick of mine after a day's skiing at Blue Cow was to exit via the top of Pleasant Valley, past that old sign that used to say "You are now leaving Mt Blue Cow. Your ticket is no longer valid", ski across to the Quad Mid Station, wait until no one was looking, then hop on for a free ride up to Top Station and do a final long run home to Front Valley, past all those late afternoon Perisher skiers struggling down the moguls of Goats Gully, unaware of the uncrowded bliss I had experienced in Blue Cow (and later Guthega) . I can admit that now, the last time you could do it was in 1994 ! I can't believe how far that guy is sending to flat. Just wondering after looking at this trail map, does anyone know if the trail here labeled "Platform" from the top of the summit chair to Guthega still possible? Do you have to hike up the wall and traverse the back of the mountain over to Parachute? Has anyone here done this run? They groom it sometimes around the back of the mtn as far as top of the race courses . Other than that it's bc. There is a run from the top of Summit that takes you to the bottom of the Freedom chair. Take Side Saddle and keep very right, aiming for the racecourse or whatever it's called, and ski under the bridge. Just don't hike the summit and think it's a smooth run over the back: there's a whole world of jumbled rocks there waiting to ruin your ride. anywhere off piste is very sharky when I think about it. that's why we need sooo many skis. Yes those tickets were so high tech then, except that after a run down the hill you'd see people trying to work out where it was when it was actually wrapped around the back of their neck, then you'd put it in the reader and let go and the elastic would fly back and hit you in the face!. And when you were skiing down the run, the thing would be going flappity flap in your face the whole way down. whether and coolair like this. Or come out of the machine and flick you in the lip, eye ect. That's the one. Only ever used them once - that was enough. That's the one. In the days before Roller Coaster had been cut through and before many of the runs had been named. Does anyone know what happened to the old chairs they removed from the Mt P Double. I asked a liftie last year and he told me they had put them into storage. I haven't heard any update to that (I would like to buy one too for the front yard). I was taking with @Normo about those chairs a couple of weeks ago and he was going to pick up the BatPhone and ask Peter B if there was any update to share when he got a chance.